LittleTown is a place to learn, grow, and play. Stretch your body and imagination in the new Gentle Gym. Try some yoga poses and exercise moves. Fuel your workout in the LittleTown play kitchen with healthy choices using My Plate placemats. ​A quick game and simple to play, Timeline: Diversity is easy to carry along in a small bag. It goes great with car rides and vacations. The cards depict an invention, discovery, or historical event on both sides, with the year in which the invention was created on only one side. Players take turns placing a card from their hand in a row on the table. After placing a card, the player reveals the date on it. If the card was placed correctly with the date in chronological order with all other cards on the table, the card stays in place; otherwise, the card is removed from play, and the player takes another card from the deck. The first player to place all of their cards correctly and eliminate their hand wins. Timeline: Diversity takes about 15 minutes to play and is good for ages 8 and up. Check out Timeline: Diversity or other board games today. Take on the role of a team of adventurers saving priceless artifacts from a sinking island. Your team must work together to secure the treasures and then make it off the island before you drown. 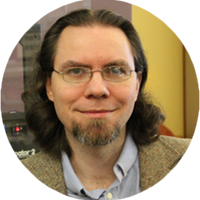 The game play is easy to pick up while providing more complexity for seasoned players. Each player gets a special trait based on the role they choose. One example is the Navigator, who can move other players around the board on their turn. 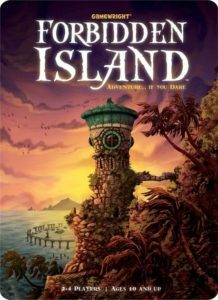 If you like to work with a group or enjoy family games nights that end with everyone happy, Forbidden Island: adventure...if you dare is the perfect game choice. The game takes about an hour to play and is suitable for ages 8 and up. Do you love the library? Have you ever thought about being a librarian? Ex Libris is a board game that allows you to collect rare (and hilariously titled) books to create a library that may even land you the position of Grand Librarian. But beware - there are pitfalls for all aspiring librarians. You will have to make sure your collection is in alphabetical order, that your shelves won’t tip over, and watch out for books that are banned by the city council. Each turn, you will have the opportunity to acquire books for your hand or place books from your hand onto your shelves. The game ends when one player has a full shelf of books. The game takes about an hour to play and is suitable for ages 12 and up. 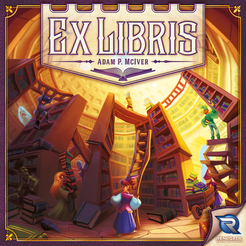 If you like Ticket to Ride or Splendor, Ex Libris would be a great next game for you. It has never been easier to produce and publish your own music than it is today, and IPPL is making it even easier by introducing new technology to our Wouldshop. Our new MIDI keyboards and Digital Audio Workstations (DAWs) are now available for checkout in the Wouldshop, or as a STEM Kit for you to create at home. Whether you're trying to produce the next big dance track, craft hip-hop beats, or provide the perfect soundtrack to a video game, IPPL has the tools for you. Learn how to create simple loops, beats, and synth sounds with StageLight, or take your ideas to the next level with FL Studio, one of the most popular production software in use today. Along with these powerful programs, we also have MIDI keyboards, USB microphones, and Bluetooth headphones available, ensuring that you have all the equipment you need to bring your song to life. Stop by the Kids and Teens Ask Us Desk today for more information! The library offers two new gaming consoles that can be used at home. The Nintendo NES Classic and the Nintendo Switch. The NES Classic is a two player console that comes with 30 pre-installed games including Super Mario Bros., Legend of Zelda, and Metroid. The Nintendo Switch is the newest addition to the Nintendo family with specialized controllers that let you play as a hand-held unit or connected to a TV. The Switch comes with Super Mario Odyssey and MarioKart, and additional games are available for checkout in the Kids and Teens department. Both consoles are available for checkout to kids and families through the library’s Tech Takeout. It is completely different than anything I have ever read. Every volume of Saga surprises me in new ways. I definitely recommend Brian K. Vaughan’s latest series for anyone who likes graphic novels and/or science fiction (and doesn’t mind mature content). If you need any other motivation, check out io9’s list of 10 reasons you should be reading this series or this other review.